Biryani is one of the most common dish in South East Asia & the Middle East. 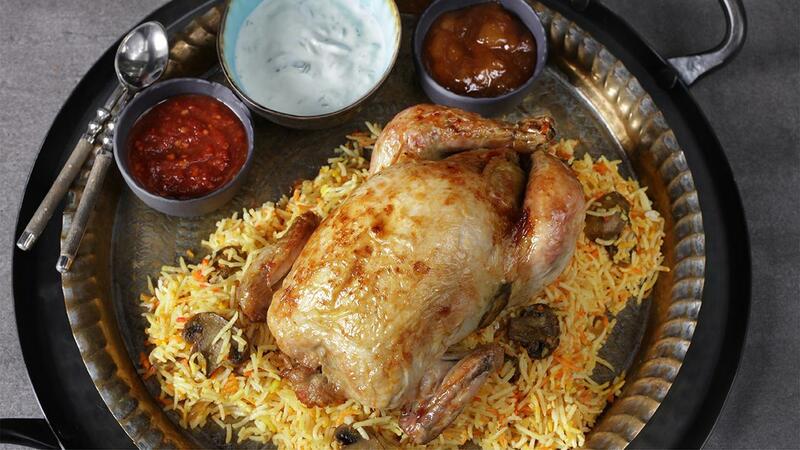 For this recipe, we make the Biryani with Mushroom only and then use it to stuff a whole chicken before roasting. View the recipe below and offer it on your menu this season! Soak the rice for 15 to 20 min. In a medium deep pot boil the water and add Knorr Chicken Stock Cubes and all the whole spice. Now cook the rice partially and drain. Set the oven to 180°C. Slice the mushroom thick & mix well with oil, black pepper and set to roast for 25-30 min. In a medium thick pot cook the onions until golden brown, add ginger, garlic, turmeric, all-purpose curry paste, freshchilli and cooking for a minute. Deglaze the pan with water and allow to simmer for3 minute. In the same pot put roasted mushroom & mix well. Finally layer the rice with mushroom masala or mix all together. Only debone the chicken’s ribcage area with a scissors, this will allow more flavours of the biryani to penetrate the chicken meat. Gently stuff the chickens with the mushroom biryani and truss the chicken or simply tie the legs with string so that the stuffing doesn’t fall out. Roast chickens in the oven at 170°C for 40 minutes or until golden brown. Serve with mango chutney and riata on the side.